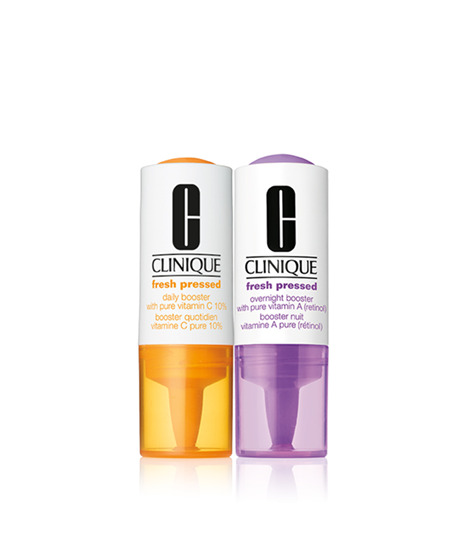 Fresh Pressed Clinical™ Daily + Overnight Boosters with Pure Vitamins C 10% + A (Retinol). Turns your moisturizer into a de-aging powerhouse. Clinique’s breakthrough day and night Boosters with Pure Vitamins C 10% and A (Retinol) are freshly activated to deliver prescription-level results against visible wrinkles. * Simply mix a few pumps with your favorite Clinique moisturizer—Vitamin C in the morning, Vitamin A at night. Enjoy a potent de-aging boost without changing the moisturizer you love. Every day, Vitamin C 10% works on skin's surface to instantly brighten. See remarkably even-toned and retexturized skin with continued use. Every night, Vitamin A (Retinol) penetrates deeply into skin's surface. Over time, skin appears revitalized, lines and wrinkles’re-filled,' youthful tone recaptured. *Proven Results Based on a 12-week clinical study using Vitamin C 10% in AM and Vitamin A (Retinol) in PM, vs. nighttime use of a leading prescription ingredient. first AM use radiance instantly boosted in 1 week smoothness and texture improved in 4 weeks fine facial wrinkles visibly reduced in 12 weeks skin tone is more even & deep-set wrinkles and forehead lines dramatically reduced Vitamin A (Retinol) is so powerful that it actively transforms skin. You may experience a little dryness, redness or peeling during the first few weeks of use—all common indications that Vitamin A is working. Be sure to wear sunscreen every day since your skin may be more photosensitive. No parabens. No phthalates. No fragrance. Just happy skin. To Activate: Leave cap on. Remove foil. Firmly press inner bulb 2x to release Vitamin into the de-aging soothing emulsion. Shake 15 seconds. To Use: Shake before use. Remove cap. Press bulb 2-3x to dispense into palm of hand. Mix in hand with a dollop of your moisturizer. Smooth all over face. Daily sunscreen is imperative.